Alice Dubois is one of the artists with disabilities whose work will be showcased at an exhibit, "CHANGE," at the Fairfield Arts Council from Jan. 14 through Feb. 19. Michael Daly is used to seeing his artwork featured on the walls of the Kennedy Center in Trumbull, where he participates in its award-winning art program, and in the pages of the center's annual "A Unique Perspective" calendar. Turn to the month of June in the 2010 calendar and the Fairfield resident's colorful painting "Fairfield Half Marathon" is prominently displayed. Underneath Daly's painting is a quote by Olympic gold medalist Michael Phelps that reads, "You can't put a limit on anything. The more you dream, the farther you get." Daly's artwork is going further. He is among 13 artists with disabilities whose work will be included in a juried exhibit, titled CHANGE, which will open at the Fairfield Arts Council's Ellen Hyde Phillips Director's Gallery on Jan. 14 and continue through Feb. 19. Some of the artists will attend the opening. The opening reception will take place from 6 to 8 p.m. and is open to the public, free of charge. It will feature a musical performance by blind soul singer Blessing Offor, of Hamden. The work of fellow Fairfield resident, Molly Hauser, is also included in the show, which was organized in response to the state's disabled artists' desire to present their work in a gallery setting. It resulted from a collaboration between several Connecticut and federal arts organizations that share Phelps' thought. "This exhibit is an outgrowth of the statewide advisory committee on careers in the arts for people with disabilities. 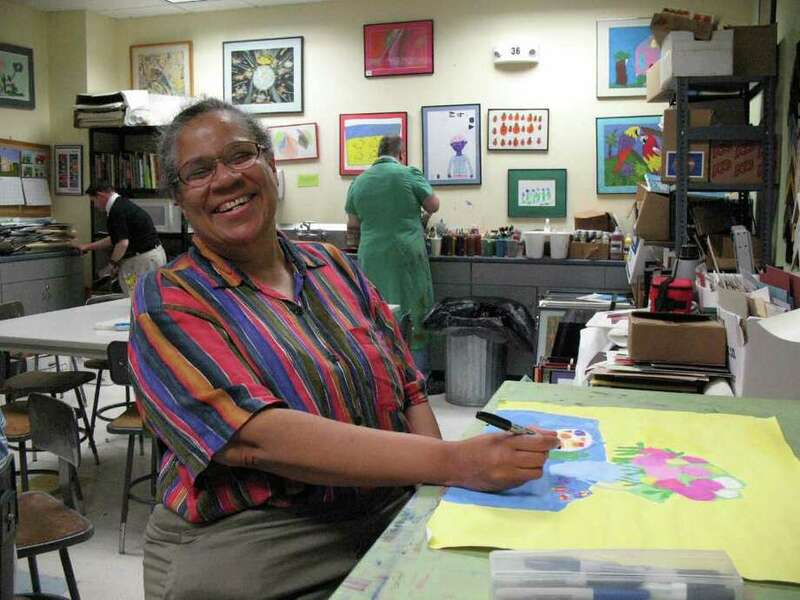 Artists with disabilities need the venues and opportunities to showcase their work," said Eileen Carpinella, executive director of Young Audiences Arts for Learning, which is co-hosting the opening reception with FAC and the Connecticut Commission on Culture & Tourism. "This is an audience we haven't tapped before, and I think the message is important," said Kristin Rasich Fox, FAC's executive director. "It's an opportunity to educate the community about people with disabilities and how they overcame their handicap, whatever it is. Art is a wonderful outlet, a vehicle for people to express themselves. That's an essential part of being human, to be able to express yourself," Fox said. She added that the exhibit helps give the artists a voice and connects them to the outside world. Ninety-one individuals responded to a call for entries in February 2010. Submissions were evaluated by jurors Stephanie Moore, then director of visual arts for VSA in Washington D.C., and Sal Scalora, former director of the Benton Museum at the University of Connecticut, Storrs campus, who selected 39 artists for the three-part exhibit series, which concludes at the Fairfield Arts Council gallery. The 13 artists whose work will be on display in Fairfield also include Jaya Dadlani and Todd Hannon, of Stratford; Alice Dubois, Marc Iaizzi and Debra Willis, of Trumbull; Marie A. Kerr and Samantha Downing, of Stamford; and Tom Gattey, Bob Sexton and Danielle Shepard, of Guilford. "They take great pride in having their works exhibited and having an expanded audience; and as for the community, having shows like this shatters myths and opens up a realm that shows the talent of artists with disabilities," said Wendy Bloch, the Kennedy Center's administrator of therapeutic services. In strict accordance with accessibility standards, the exhibition will offer materials printed in Braille and in large typeface, sign language interpretation, audio descriptions of the artwork and an installation that places the artwork at a comfortable viewing level to ensure access to the arts is provided to all regardless of abilities. For more information, stop at the Fairfield Arts Council office and gallery at 70 Sanford St., call 203-319-1419 or visit www.fairfieldartscouncil.org.